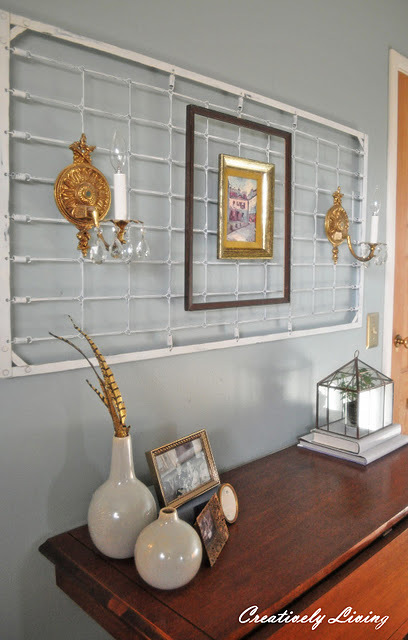 52 Mantels: Oh, it's a day of features! Oh, it's a day of features! Features on a Tuesday? I know. It's crazy-town. 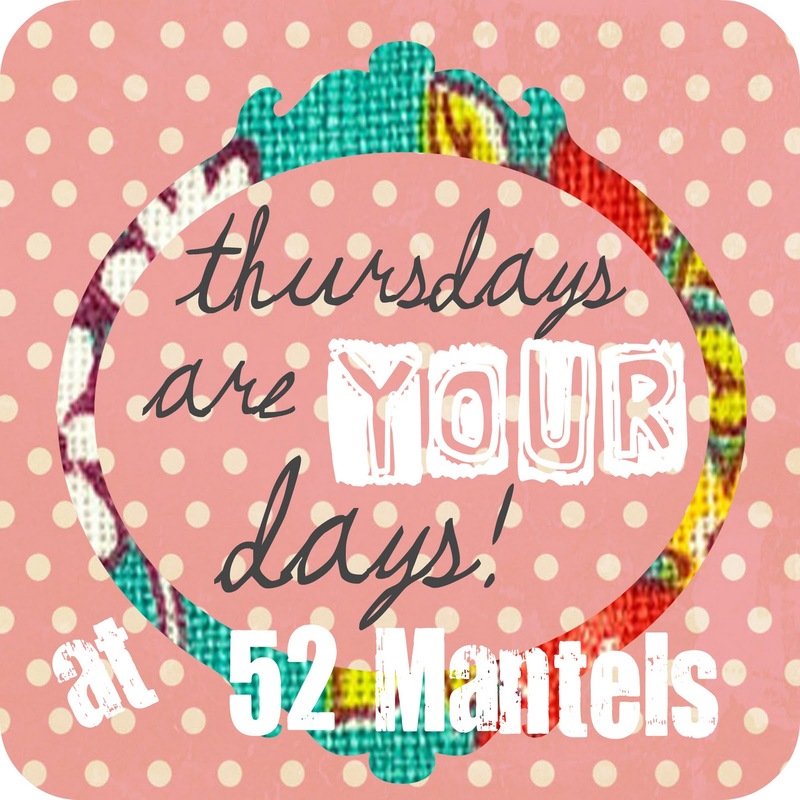 Tuesdays at 52 Mantels are for showin' you MY things. My project-things, my craft-things. Maybe even my box-mix recipe-things (ha, c'mon, you know I love box mixes!). However, today I'm showing you YOUR things instead of my things. Why? Because on Wednesday when I like to show you your things, YOU'RE showing me your things. And, then on Thursday when you normally show me your things, I'M back to showing you MY things. Allow me to translate: This week our weekly link party, Thursdays are YOUR days, is moving to Wednesday!! Because on Thursday I'm participating in a SUPER exciting Valentine series called 14 Days of Love, hosted by Ashley at Cherished Bliss! It's going to be 14 wonderfully glorious days of Valentine projects, followed by an over-the-top giveaway! Kick off is tomorrow at The 36th Avenue and then guess who's on deck for Thursday?? Yep, me! Which is why our party is moving up a day. And, why our features are happenin' today! Last week's party was incredible. Like, I wish it were a little more lame, because then I wouldn't want to feature all 84 of the projects shown. Because now? I want to feature all 84 of the projects shown. But, as my husband pointed out, that would be insane. Even for me. So, I've painstakingly (oh, it was painstaking) narrowed it down to a manageable list of features. 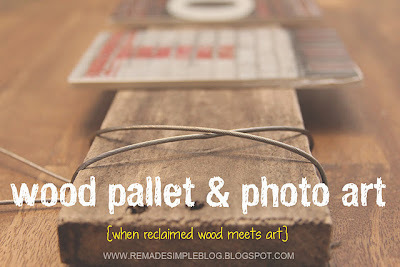 The most viewed project was the Pallet Art by ReMade simple. It's way cool and like always, Kristina brings us incredible photographs. Beautiful works of art, for sure! 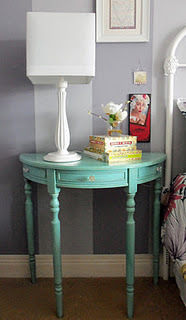 Larissa Hill Designs shows us what a can of spray paint can do to a console table. Are you seriously in love with this table? This color? Are you seriously intrigued by the iron bed peeking into the picture? Me too!! Oh, we are on a roll now! Creatively living got seriously creative with this wall art made from a crib she found by the dumpster. I know, right?!! I'm in love with how sculptural and unexpected this is! The seriously talented Abbie from Five days, 5 ways wowed with her red and teal kitchen makeover. 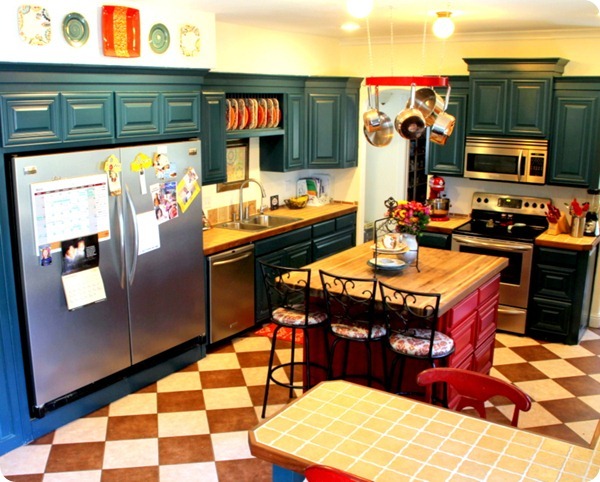 Oh, and it was a $6000 budget-conscious makeover. Excuse me, did you see that fridge/freezer combo?? How did she do all that AND get those appliances for that price? Go on over and find out! 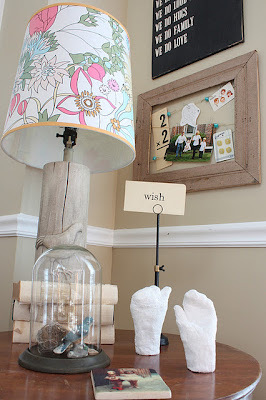 Jenni Horne Studio showed us this perfect little hallway vignette and you know how I love vignettes. Tabletop vignettes are first cousins of mantels, don't you agree? 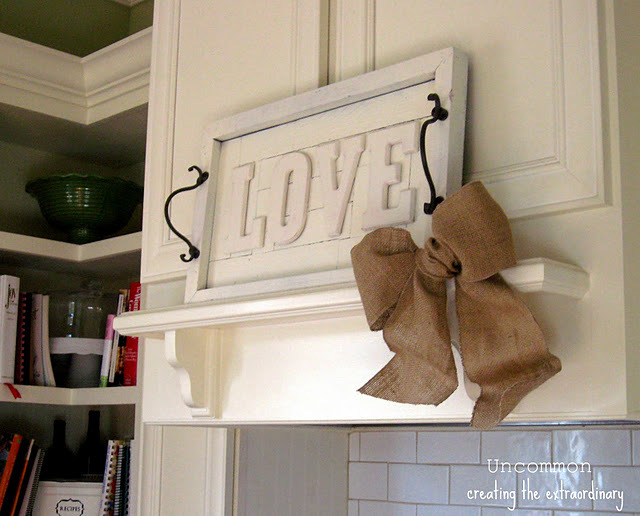 Uncommon showed us how to make this beautiful Pottery Barn knock-off LOVE plaque. I (wait for it) LOVE it! 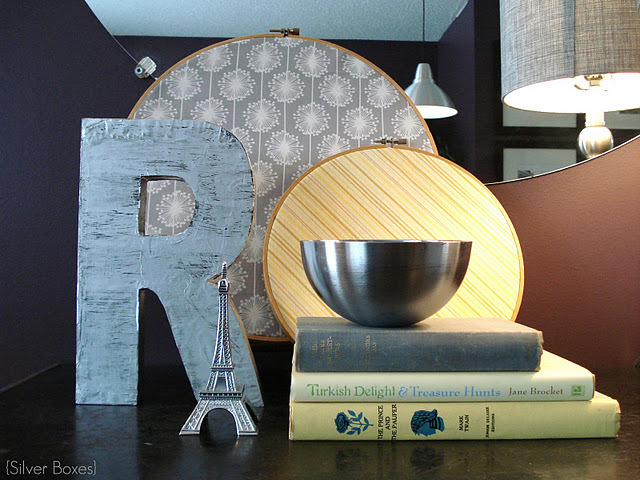 Silver Boxes gave us another lovely, layered vignette. And, it's so fresh in a yellow and gray color palette! Beautiful! My Serendipity Home is in the process of making a beautiful home for herself and her hubby. 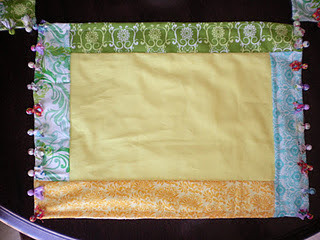 She found a sewing machine at a thrift store and THESE Anthro knock-off placemats were her FIRST sewing project. Ever! Aren't you impressed?? And, inspired?? Me too! 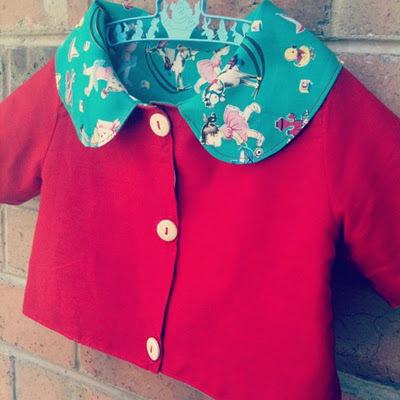 Two Little Red Bobbins made this "Molly Jacket" for her lil' punkin! I am SO wanting one for my lil' punkin! Look at that adorable vintage turquoise fabric on the reverse side! SO cute! How about some sweets for your Valentine? Okay! Keep reading..
Angela's Adventures showed us how to make this heart shaped marshmallow! When I first saw it, I thought she homemade the marshmallow, which bummed me out. Because, you know, that seems complicated. But, nope!! She melted minis. Which made me happy, because I definitely know how to melt things! Go read her tutorial. 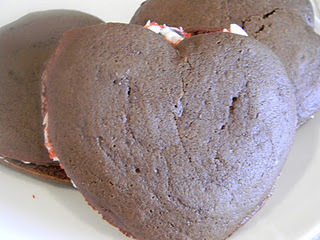 Morningnoonnight made lots of yummies, one being these Valentine Whoopie Pies. They look SO good and even have Cherry flavored filling! Oh, delicious! My hubby might get these for Valentine's Day. 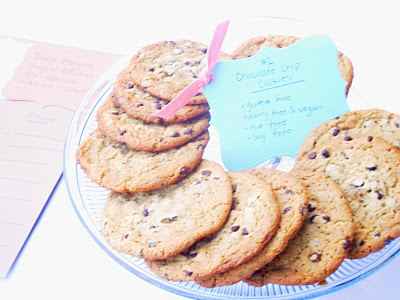 Sugar Mama Bakeshop showed us the recipe for her Favorite Chocolate Chip Cookies and they are gluten free, so I'm definitely filing this recipe away for my sis! They look yummy! If you haven't checked out Sugar Mama Bakeshop, do so! She always has yummy gluten free, vegan, organic recipes! Wow, seriously, you guys linked up some great things!! If you'd like a featured button, here it is! Don't forget to come back TOMORROW for Thursdays are YOUR days! That's lots of days of Valentine ideas. I can't wait to see what you all have up your sleeve. Thanks for featuring my heart shaped marshmallows. You need an "I was featured" button! What an honor to be included in a such a great round-up! Thanks, ever so much, Emily! Great features! 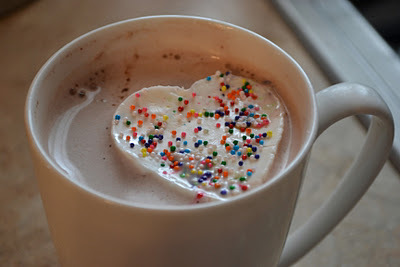 I love that little jacket and those heart marshmallows look divine! Emily thanks so much for featuring my pallet art! It was such a fun and easy project, that anyone can do...and so affordable. Hope your having a great week! كما أن المؤسسة تستخدم افضل الآلات والمعدات والماكينات التي تقوم ببخ مادة قاتلة للحشرات التي قد تصل إلى أدق الأماكن في المطبخ وغيرها من الأماكن المقفلة وهذا لضمان المكافحة الختامية. كما أن المؤسسة تتلقى الاتصالات من الزبائن يقولون انهم استعانوا بمؤسسة أخرى وبعد مرحلة ظهرت الحشرات مره أخرى، ولكن شركتنا تقوم المكافحة على نحو ختامي .